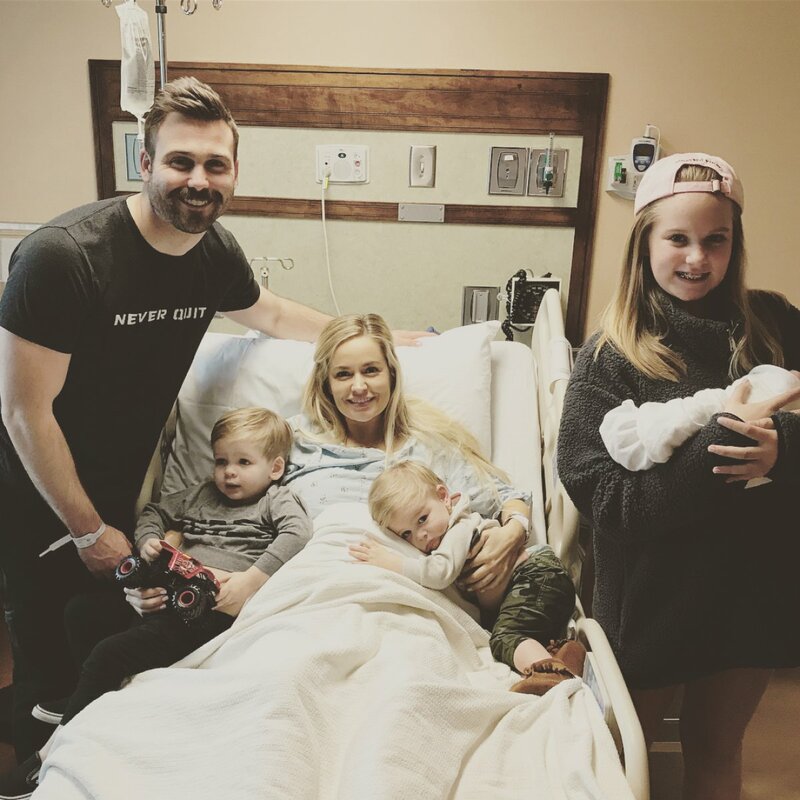 Emily Maynard certainly has her hands full now that she's welcomed another baby! The former The Bachelorette star gave birth to her fourth child on Sunday. Emily's husband, Tyler Johnson, revealed the big news through an Instagram Story on his account. Tyler shared a video of Emily in a hospital bed cradling their newborn and captioned it, "#4 here!" Prior to the big reveal, the proud dad shared a video of the moment he accompanied his wife to the hospital. "Baby four, let's get it," Tyler said. "Can't wait to meet you. We love you." Emily and Tyler are already parents to Jennings Tyler, 2, and Gibson Kyle, 1. The former reality TV star also has a 12-year-old daughter Ricki from a previous relationship. Tyler also took to social media with a sweet photo of big sister Ricki holding the new baby; but didn't disclose whether Emily delivered a boy or girl. However, late Monday morning, Emily posted her own social media photos of the newest family addition and revealed the newborn is a still unnamed baby boy. "Welcome New Baby Johnson to the world. If anyone has any good boy names send them my way! We need help!," she wrote on Instagram. The couple first announced they were expecting Emily's fourth child in late August following months of speculation she was pregnant again. After Tyler broke the news on Instagram with a picture of Emily and Jennings walking down the sidewalk hand-in-hand while munching on ice cream bars, Emily shared the same photo on her own account. "Way too many tacos at lunch. Seriously though, as scared as I am to have 3 under 3, I'm so grateful God picked me to be the mommy to my kids and we can't wait for number 4 to get here!" Emily wrote alongside the image. "This pregnancy has been filled with lots of hot wings, ranch dressing, an emergency appendix surgery at 6 months, and swollen ankles all day every day but I wouldn't change it for the world. My little tribe can't wait to meet their new brother or sister (it's a surprise!) in the next couple of weeks!" Emily and Tyler wed in June 2014 and welcomed Jennings in July of the following year. Gibson later arrived in September 2016. Emily had Ricki with Ricky Hendrick, a NASCAR driver who tragically died at age 24 in a 2004 plane crash when the jewelry designer was pregnant for the first time. Years after Ricky passed away, Emily appeared on Season 15 of The Bachelor starring Brad Womack. Brad ultimately proposed during the March 2011 finale but they split that same year. Emily then became The Bachelorette's eighth-season star in 2012, when winner Jef Holm popped the question. The pair broke up in October of that year, a few months after the finale aired on ABC. Emily experienced heartbreak three times before falling in love with Tyler, a man she had met at church, but she had told the press in recent years she has no regrets. 'Dancing with the Stars' spoilers: The semifinals couples perform two full routines, both with a twist!